Once you know that cows share 80% of the same genes as humans, you can begin to sew together the relationship of cowboys, fairs, parades and nostalgia. Jeans and genes. The relationship wears well in this community with a fair that began in the 1860's showcasing ranching, farming, quilting and canning. As the Frontier Days came again to the Walla Walla Valley, I began to feel in my genes that fondness for cows, my genetic relatives. The day with cows usually begins on Saturday at the parade. Although cows are little in evidence the cowgirls, cowboys and ubiquitous pooper-scoopers remind you of the skills required to move them "doggies" along. The parade wave was developed so that cowgirls and cowboys could ride a long parade route and not become tired waving. Seems too like it could have been a signal to hypnotize the cows into following. I'm just speculating. I'm no cowgirl. From the parade I headed to the fair grounds. When I arrived this year the fair seemed like a stage setting for a western movie with a dust storm sweeping through from the southwest. The dirt was blowing across the rides, settling on the food and whipping flags into loops. We all got to be the extras in the movie, dust included. I headed to the cow barn, a good windbreak and stage setting for my role in the western. I have a fondness for this cavernous barn filled with gentle mooing, the smell of the barnyard and cows laying side by side in shades from obsidian black to ruffled browns. The still air carries a feeling of reverence. Of honor. Of hard work. 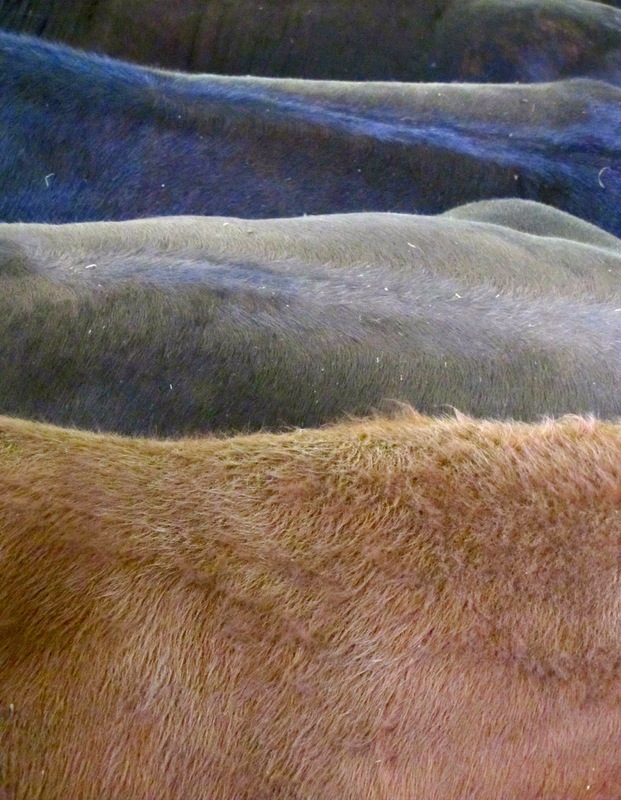 The movements in the cow barn are quiet and subtle. The teenage cowhands sit tipped back in their chairs, boots resting on bales, conscious I am sure, that they are being observed and envied. On some indeterminate schedule a teen will get up and sweep or shovel a pathway gently touching cows in passing. Older cowboys are always present, but never seem to sit in chairs drawn up in groups like the young cowhands. The names of the ranches are hand painted on wooden boards and hanging proudly from the stalls above them and their cows. The ranchers stand talking to passing friends.. who are also in jeans and cowboy hats. Outside the cow barn I watched judging. I edged close, so that I could hear the questions and the answers given by the FFA judges and students. The rarity of being present as one generation to the next imparts information in a respectful, kind and courteous manner is, I think, the essence of my love of the cows and the cow barn. When a good-sized cow balked and was muscled into place with a strong tug, I am reminded that this is not a textbook game. Being a cowboy or cowgirl is tough work, despite that calm unruffled barn atmosphere. Elders earn a measure of respect in this field as does being a hard and knowledgable worker. Although cows don't share any great measure of those brain genes that we possess, cows usually respond well to calm and clear expectations. Cows can fathom the difference between being treated graciously and meanly. The cow barn. A place of old-fashioned values dressed in jeans and hides.